Today the temperature made it into the 40s and I seized the opportunity to head outside and prune my pear trees. 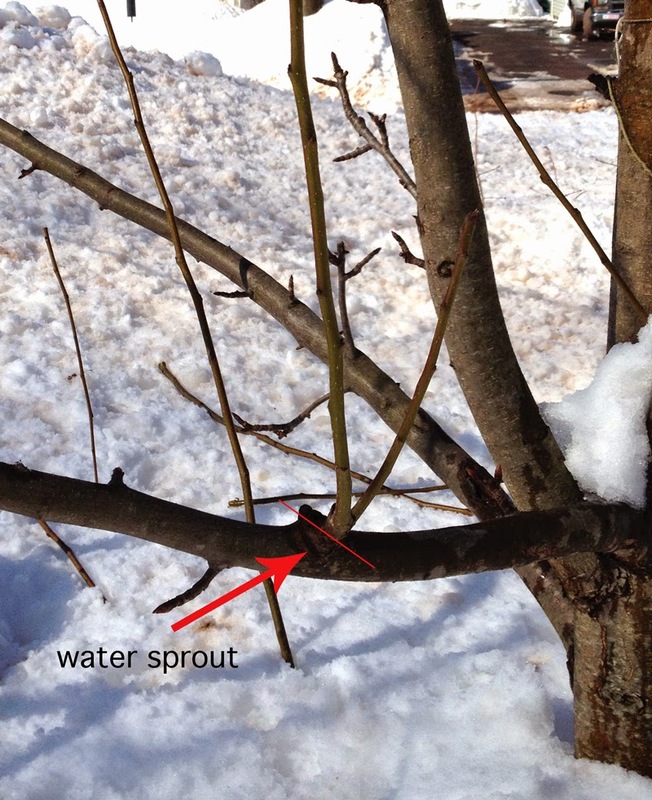 Pear (and apple) trees can be pruned in late winter, usually after the coldest part of the season has passed. This year I waited longer than usual because Connecticut has experienced long stretches of temperatures ranging from 1-20 degrees Fahrenheit in February. Many reasons to prune a fruit tree. 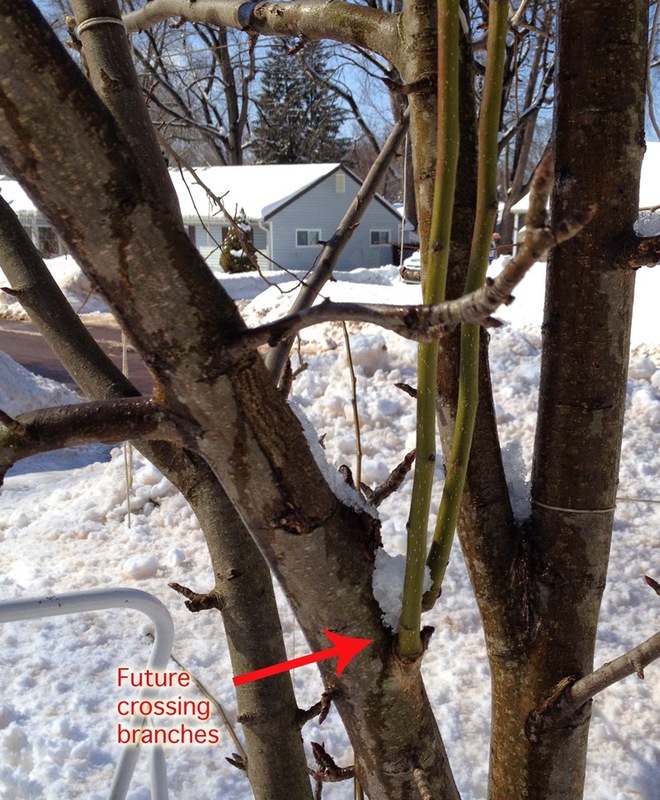 I prune out branches that will allow for more air and light to reach the center of the tree. This helps for better fruit production. You want enough space between branches for this, so any branches too close together need to be pruned (see "not enough space between branches" above). Any branches that cross each other are also pruned. Sometimes I remove one and keep the other, depending on where they are in the tree (see "crossing branch" in the graphic above). It's important to prune to the collar of the tree when pruning a branch off. Don't cut in the middle. Don't leave a stub. 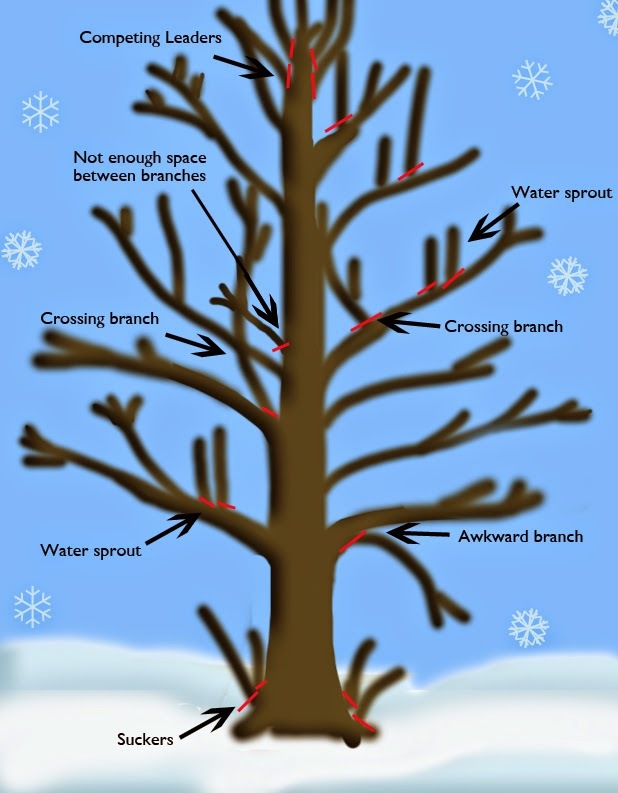 The easiest pruning one can do is removing water sprouts from the tree. These are branches that grow straight up and would not be strong enough to support fruit (see "water sprout" above). They are easy to identify and help give a timid gardener more confidence when pruning the tree. I removed many of these today. Competing leaders (shown above) is when there are too many branches at the top of the tree. Usually one bad cut in the tree's past will make this a problem. If the tree has suckers, which are straggly branches growing at the base of the tree, remove those. They take away energy from the tree. Awkward growing branches that dip too low should be pruned out as well. Of course, anything that is broken or damaged should be removed, not just in late winter, but any time of year. Make sure your tools are sharp and use an alcohol wipe to disinfect the blades when moving from tree to tree.